Sarah Friar is Chief Financial Officer at Square. Sarah joined Square in July 2012 from salesforce.com, where she served as SVP of Finance & Strategy. Prior to salesforce.com, Sarah worked at Goldman Sachs for over 10 years, with experience in corporate finance, M&A, and equity research, and ultimately as lead software analyst and Business Unit Leader for Goldman Sachs’ Technology Research Group. She previously worked for McKinsey in both London and South Africa. Sarah sits on the Boards of New Relic (NEWR), a software analytics company, Slack, a business communications platform, and is the vice-chair of the Board of Spark, a nonprofit passionate about changing the lives of at-risk middle schoolers through mentorship. She sits on the Advisory Council for N. Ireland Executive Ministers, providing advice on key economic issues and trends in the U.S. which are likely to impact the growth of the Northern Irish economy. Sarah is a Fellow of the inaugural class of the Finance Leaders Fellowship Program and a member of the Aspen Global Leadership Network. She earned her MEng in Metallurgy, Economics, and Management from the University of Oxford and her MBA from the Stanford University Graduate School of Business, where she graduated as an Arjay Miller scholar. Women in the field of technology are definitely in the minority, so why did you decide to pursue a career in tech? Can you tell us a little bit about your path and how you got to where you are today? There are a few things that I’ve used to guide my decisions through the years. One of the first things I thought about was what gives me energy and sparks creativity. For example, I love to travel, I love interacting with people and building teams, and I really enjoy analyzing problems – the more mathematical the better. There wasn’t necessarily a single job that checked all those boxes, but it helped guide me toward types of careers, and types of companies that I thought would enable me to mold a job into a passion. I feel particularly passionate at Square with our purpose of Economic Empowerment. It’s very fulfilling to feel that what I do every day at work is having an impact out in the world – if even with a single merchant. It was also very important to me to be in control of my career. I always look for ways to create “spikes.” It’s better to have one or two things you’re an A+ at, rather than 10 things you’re a B at. One of the best pieces of advice I got from a female mentor was to find a career where the outcomes could be measured quantitatively. This helps remove some of the systemic or perception biases that can hold women back: it doesn’t matter who you know, or how many sports games you’ve attended with them – it’s about strong, measurable results. A career in tech lends itself to that because it’s an industry that embraces data and logic. How do you feel your Irish roots have shaped who you are, and where you are, today? I grew up in a small village in Northern Ireland during the height of The Troubles, surrounded by bombings and shootings. But I was really lucky to have family that taught me the importance of giving to others above all else. My parents lives were centered on helping others: My mother was the district nurse and my dad was the personnel manager at the local mill. They instilled in me a “people first” mentality that I have to this day. I often talk about it at Square and I truly mean it. If you put others first, it just keeps coming back to you in spades. My job as a leader is to build and support a strong team that will carry our organization forward. Also, for me personally, putting others first just makes me really happy. I also believe The Troubles were ultimately solved by bringing everyone up to a certain level of wealth and comfort, hence why I feel driven to help small businesses start and thrive, as a way to bring lifeblood into a community. What do you consider to be the biggest challenge for women working in technology? Well, unfortunately, there are massive systemic biases, and not just in tech, in every industry. One positive is that there seems to be much more discussion and acknowledgment about these biases, particularly in recent months. Of course there’s still so much work to do, and as a society, we either care about it and we're going change it, or we pay it lip service but don't actually care. At Square we’ve invested in things like teaching unconscious bias training to everyone. It starts with awareness - where might we be making assumptions or allowing preconceptions to cloud our views on someone’s abilities and output. It’s why it’s important to set clear goals in advance, quarterly and annually. That way we can more objectively measure outcomes, but allow people to be wildly creative in how they achieve those goals. Have you seen attitudes/culture change since you started your career? Yes and no. In one of my first jobs it was expected that women wear a skirt to work! Can you imagine. Today, thankfully, I believe we’re focused much more on what people can do, rather than how they look. I’ve also moved through numerous countries in my career: the UK, South Africa, and now the U.S. I do believe that here in California the ability to think big and embrace risks is still much further along than what I see in the UK. I have been working with a couple of Northern Irish start-ups, Hurree and Momenthealth.io. Both founders are passionate, creative, and full of hustle, but I constantly hear them being told to think more rationally – which is just code for “Don’t think too big.” Or being told to be much more mindful of risks or spending etc. To use my husband’s favorite quote, “You can’t increment your way to greatness.” I’d love to see the business community there be more embracing of the entrepreneurs who are really putting themselves and their companies out there. What advice would you give to women looking to break into technology? Well, in addition to thinking about what makes you happy and taking steps to ensure you’re in control of your career, I’ve found mentors to be invaluable. But it’s important to be front footed in pursuing mentors and look for people that aren’t just like you. And you have to be persistent because they’re probably very busy, so you need to be creative to find ways to fit into their schedule. Also – and this is a step many people overlook – after you meet with them, follow up. And not just to say thank you, but to close the loop. Thank them for what they said, tell them what you did, and tell them what the outcome was. You want them to know that the time they spend with you is meaningful. Also ask how you can help them – you’ll be surprised! And it’s a great way to make them want to continue to spend time with you. In your view, what steps should be taken, as a community and as a sector, to help sway the pendulum for women? We have to keep using our voices to speak up. There can’t be real change until everyone acknowledges there is a problem, and sadly – though there has been some progress – there is still a long way to go. For example, in the U.S., only 6% of the S&P 500 companies have a female CEO. This is an undeniable gap. With a problem this big, everyone has to do their part – not just women, men too. I’ve been so fortunate to have incredible mentors in my life, and it has 100% made a difference for me. One of the biggest moves in my career – leaving Goldman Sachs – actually came about from talking to one of my mentors. He told me that I would be a great operator. And he told me this every time I would see him, and it caused me to question my career choice to date and gave me such confidence to take the leap. Any time I’m thinking small, he’s always thinking big on my behalf. Jack is similarly a great mentor - he’s always pushing me to stretch. In my reviews, he says, “I want you to figure out how to be the best CFO in the world.” He never thinks small and it’s really freeing. From a personal perspective, Ruth Simmons, one of Square’s board members, comes to mind. She’s just amazing. She’s been at Square to talk with our company, and she shared some experiences and challenges from her childhood. What makes Ruth stand out to me is her optimism, love of life, and commitment to learning. She is completely uplifting and inspiring to be around. In the past, you have shared four tenets that you live and lead by – Get a daily adrenaline rush; Do what you love; Pay it forward; Create a Board of Directors, and use them mindfully. Can you elaborate on these? I’d start off by saying that they’re all very related – it’s all about being proactive and setting yourself up for success. I focus on getting a daily adrenaline rush because it helps ensure that you’re constantly pushing yourself, and not just to learn and improve but also to take risks. We talk about this a lot at Square. The company has been successful so far, but we want to make sure this doesn’t make us complacent, that we continue to take principled risks. Doing what you love is how you turn your job into a career and into a real passion. Paying it forward creates long-term loyalty and wins hearts. Take the time to take the call, provide a short burst of mentorship, make an intro, give some real-time coaching. All of these things also make you happier, which I believe creates a well of energy that you can draw from when things are challenging. Sarah with co-founders Jon Bradford, Aaron Taylor, and Steve Pette. You are involved in Ormeau Baths, a tech incubator space to foster startups in Belfast. What is the climate of entrepreneurship in Ireland today? I'm so delighted to be supporting the Ormeau Baths and innovation within the city of Belfast. There’s a burgeoning tech scene in Northern Ireland, and I’m really excited to support to the region's entrepreneurs. Ormeau Baths provides entrepreneurs with a physical office to work from, but, importantly, it also offers them the opportunity to access a network of expertise and experience from professionals here in Northern Ireland and internationally. That network is a critical part of any startup's success and something I'm really proud to be part of. 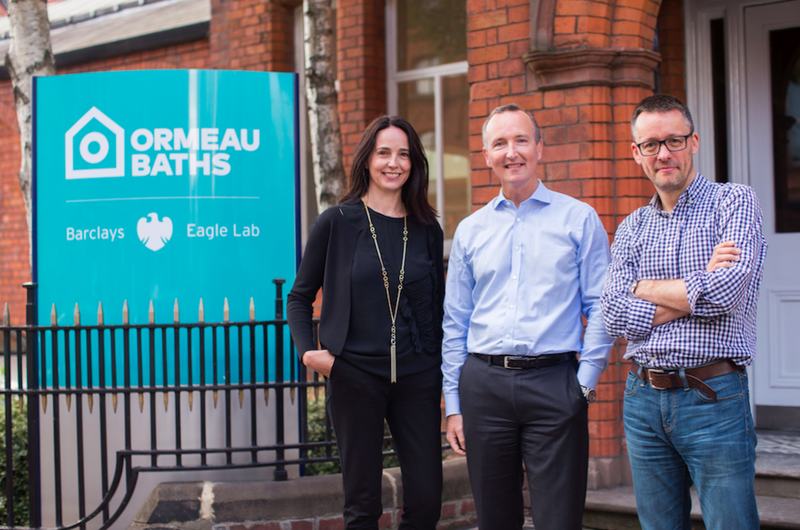 Sarah with Adrian Doran, Ormeau Baths Partner and Head of Corporate Banking for Barclays in Northern Ireland, and co-founder Jon Bradford. Sarah with panelists (L > R) Nuala Murphy, CEO & Founder of Moment Health LTD; Rosaleen Blair, CEO & Founder of Alexander Mann Solutions (and keynote speaker at Ladies Who Launch); Orla Smyth, Owner of Kaffe O, Khara Pringle, Owner of Khara Pringle Photography; Danielle Morgan, Owner of Flax Fox Designs; Katie Doran, Partner at Lanyon Communications; Sinead Murphy, Co Founder of Shnuggle; Sara Hamil, Director, KPMG. What inspired you to start Ladies Who Launch? It’s all about creating economic empowerment, closing the gap, and doing everything we can to ensure everyone has access to the tools they need to succeed. With my co-founder, Kelly McGonigle (also at Square) we’re focused on providing Community, Education, and Inspiration. Female entrepreneurs are an underserved group within an underserved group. As we’ve seen firsthand at Square, entrepreneurs and small businesses typically don’t have access to the same tools as larger businesses. And we see that women are particularly underserved. For example, only 18% of traditional loans go to women-owned businesses while at Square this rate is 54%. Ladies Who Launch is a creative outlet for us to start small and get these women meeting each other and garnering inspiration from those who have achieved success and therefore know the tough journey of founding and building a startup. Our evening events are a font of happiness and energy - you all should come to one! When you reflect on the Ladies Who Launch event in Belfast, what are the key things that come to mind? We were fortunate to have an incredible group of women participate, and my key impression was a thirst for more community building. Ireland, Northern Ireland, Belfast – these are not well served in terms of events like this, and the attendees were so appreciative beyond what I’ve seen in other cities. 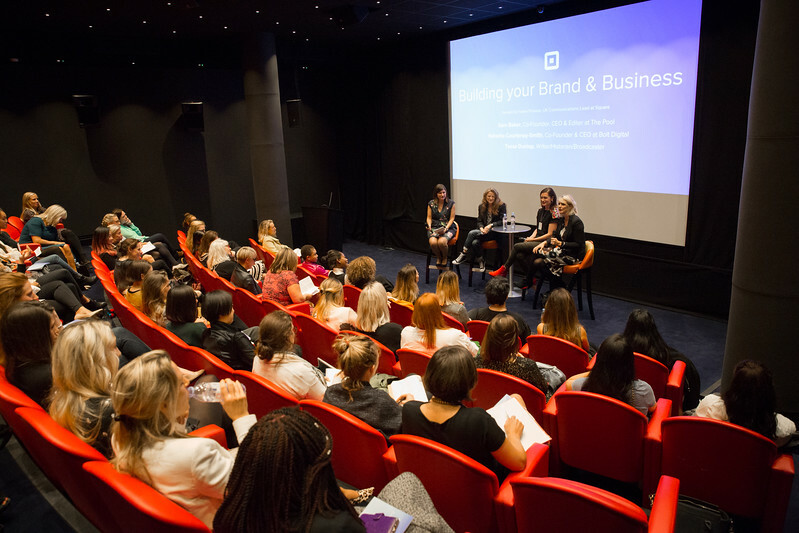 The audience was largely women who are already on a journey of running their own businesses. They brought pragmatism, wisdom, and lessons learned, and they were really seeking ways to think bigger and scale. Northern Ireland is an exciting but small market, so going beyond its borders is a must for most of these women. If you could go back and give your “younger self” any advice, what would it be? Have no fear, don’t hold yourself back. Aso, it may not be easy to stand up and speak out for what’s important to you, but you will be amazed at how fulfilling and empowering it will be for you and for the people around you.